The world instant coffee market is highly fragmented and it comprises multiple players. The market is estimated to experience substantial increase in the production capability as many different market suppliers are now focusing on the usage of advanced technologies for the production of high quality instant coffee. A boost in the volume of production will also allow the market players to cater to the ever increasing demand for instant coffee across the globe. The world market for instant coffee is mostly led by the prominent players who are working towards acquiring new brands so as to continue their market dominance and augment their share in the world market for instant coffee. The prominent market players that are operating in the world market for instant coffee are focusing on product innovation and are involving various acquisitions and mergers so as to expand their global presence. Some of the market players that are now dominating the world market are Keurig Green Mountain, Starbucks Corp., Tata Global Beverages, Tchibo coffee, Jacobs Douwe Egberts, Matthew Algie & Co. Ltd., Nestlé S.A., The Kraft Heinz Co., Strauss Group Ltd., and Unilever Plc. The world market for instant coffee stood at an initial market valuation of around US$ 28.12 bn in the year 2016. This market valuation is anticipated to reach an overall valuation of around US$ 42.5 bn by the end of the year 2025. 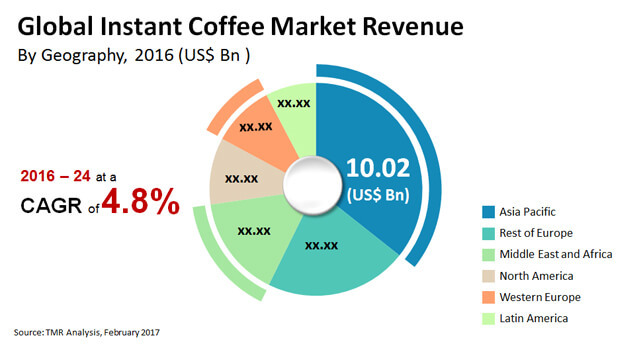 This growth of the world market for instant coffee is projected to be achieved with the assistance of a sound CAGR of 4.8% over the course of the given forecast period that extends from the year 2017 to 2025. The world market for instant coffee has been regionally segmented into the geographies of Latin America, North America, Asia Pacific, Middle East and Africa, and Europe. With a share of around 35.7%, the region of Asia Pacific dominated the overall market in the year 2016 and is anticipated to remain on top over the next few years to come. The increasing interest of consumers for instant coffee in India and China has been driving the said market for instant coffee in Asia Pacific. Amongst others, the demand for instant coffee is particularly high in the Rest of Europe. Various countries, such as Bulgaria, Russia, and Poland demonstrate a considerably high rate of demand, which is estimated to continue to rise in the years to come, thereby retaining the second position in the world instant coffee market. North America, on the other hand, is anticipated to witness a decline in the demand for instant coffee in the near future owing to greater preference for filter coffee.